Annie Dressner may be a new name to a lot of people but on the evidence of her debut album STRANGERS WHO KNEW EACH OTHER’S NAMES this situation may be soon set to change. This impressive offering from a singer-songwriter who has recently re-located to the UK from her New York home is a collection of enchanting songs that will hook you in from the very start and keep you enraptured throughout its duration. 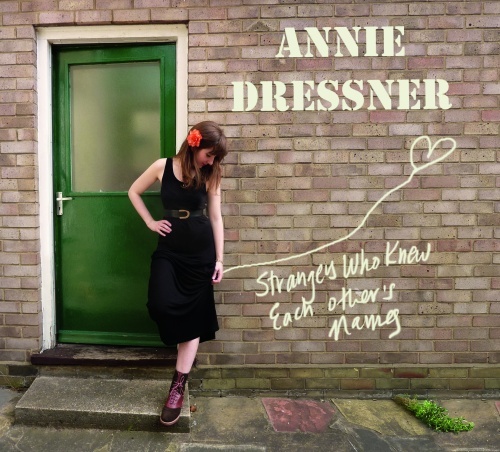 The sound created from Annie’s distinct and unique vocals coupled with the varied musical accompaniment has an alluring wide appeal that will engage with fans right across the spectrum of roots music. Much deliberation about the style has drawn a conclusion to a mix of the orthodoxy of Lucy Wainwright Roche and the distinct sound of Caitlin Rose. Fans of modern folk especially that emanating from the New York scene will find some appeal in the album. There is also a sufficient hint of twang in the sound to engage those who like their Americana music a little less rounded and classical. Overall the mesmerising vocals of Annie will leave a lasting effect once their spell has been cast upon you. The opening track titled ‘Fly’ will instantly lure you in and grab your attention that will remain throughout the 38 minutes of the album’s duration. It is difficult to argue against this track being the stand out one, although it is closely rivalled by the excellent ‘Cigarette’ with its lovely scene setting intro before launching into some effective guitar work. Those on the lookout for a hint of left field country/Americana will enjoy the subtle twang of ‘September’ and the various traditional string sounds added to the impressive ‘Hardy Boys’, another of the album’s better tracks. Those who prefer their singer-songwriters to have a more indie guitar driven sound will be drawn towards ‘Find Me’, all in all demonstrating the eclectic nature of this record. The final song of this eleven track collection ‘How Am I Supposed To Be’ is the perfect concluding number with its low key simple guitar enabling you to drift away in a state of satisfaction. Other tracks worth mentioning are the homage to the iconic New York neighbourhood ‘Brooklyn’ and the title track which is a tuneful number containing some fine guitar work. On the surface, the lyrical content is worth exploring but this would be greatly enhanced by the online availability of a lyric sheet to accompany this download. The tools are in place for Annie to create a niche in any number of different scenes. She is hitting the road in the New Year and will be worth seeing to complement the listening of this fine and recommended album.